Attending your first live show can be a fun and rewarding experience but it is also incredibly intimidating and scary. Just remember that every single person in that room has been in your shoes and know exactly how you feel. I always tell people who are nervous about my first show. At my first show my father dumped me at a village hall in Birmingham and left me there. By the end of the day I had made lifelong friends and although I only got three placings I had a brilliant time. I was hooked. Now I attend nearly every UK live show! This guide is a designed to help the first time shower negotiate the minefield that is live show attendance. It is very much a 'I wish I had this before my first show' guide but it does not answer every question. If you have any questions about attending your first show then feel free to drop me an email at catriona@chestnutridge.co.uk I am always more than happy to help. The first step to attending a live show is to actually find one to attend. How you find a live show will very much depend on where you live. Because I live in the UK this entire guide is based around attending UK live shows, if you live in other countries then start with google and then ask in places such as Facebook groups if you are not sure. If you are not on Facebook then ask a family member who is to join on your behalf and have a look at the lists. Pretty much everything is organised via Facebook nowadays, which is a bit annoying if you don't use it! Once you have found a show then you need to get hold of a schedule to see if it is suitable to attend. You may need to join the show's Facebook group or simply message the show host and ask for one. (3) How will I get there? (4) Does it have sections for the models I own? If you are confident that you can easily get to the show and it has sections for the types of models you own then you can think about booking your space. To book your space either message or email the show host and ask if there are any spaces left. Many shows sell out quickly - if the show is sold out they may put you on a waiting list, you may still get a place if someone else drops out. If there are spaces remaining then have a look at the schedule to find out how to pay and how much you need to pay. Once you have sent over your entry fee you are all booked on! Some shows may also ask for an entry form, make sure to fill this out and send it in in good time. Most shows have different entry types and it is important to understand these so you know how much you actually have to pay for your show! Full Table/Standard - This is the amount you will most likely pay. This is the cost of a full table. Half Table/Under 'x' Models - If you are only taking a few model horses the show host may offer a reduced rate, this usually means you can only bring a small number of models and you may have to share a table. Some shows may also have additional charges such as for a cooked lunch or if you want a sales table. Remember most shows allow people to put out sales at lunchtime so only book a sales table if you really need one. Often these will be booked by retailers who aren't showing but wish to sell. I think it is really helpful if we look at a real schedule and talk through what everything means. This is a schedule from a real live show that I ran several years ago. I chose it because it is a general show with lots of different sections (although it doesn't have performance). Please note that for obvious reasons I have blacked out people's names and contact details! This schedule is 10 pages long. I have uploaded a screenshot of each page with an explanation numbered code below each one. This will tell you whether or not the live show is a qualifier. It is important that the statement 'I will be applying for BMECS qualification' does not mean that the show has actually been awarded qualification status. This is the championship for the section. 1st place horses from the above section will move forward to this section. Many show hosts will clarify exactly what can go in each section. Note how this section includes commercial resin and china. Many show hosts will clarify exactly what can go in each section. Many show hosts will clarify exactly what can go in each section. Note how this section includes Animal Artistry. This is details of the sponsor of this section. This is the overall show championship. Champions and reserves from the section championships will move into this. 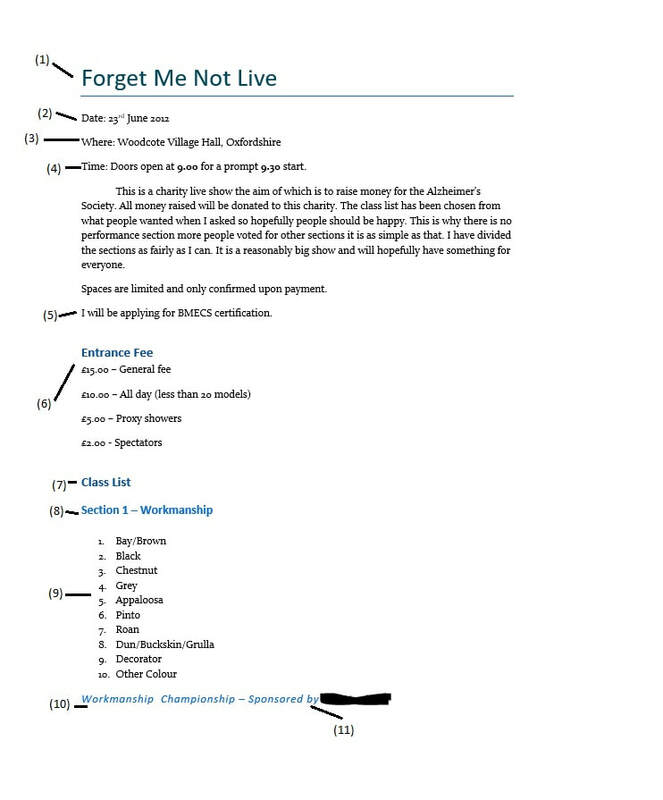 Every show will have a detailed list of rules. Most of these will be general and the same for every show although some, such as entry limits, will vary. 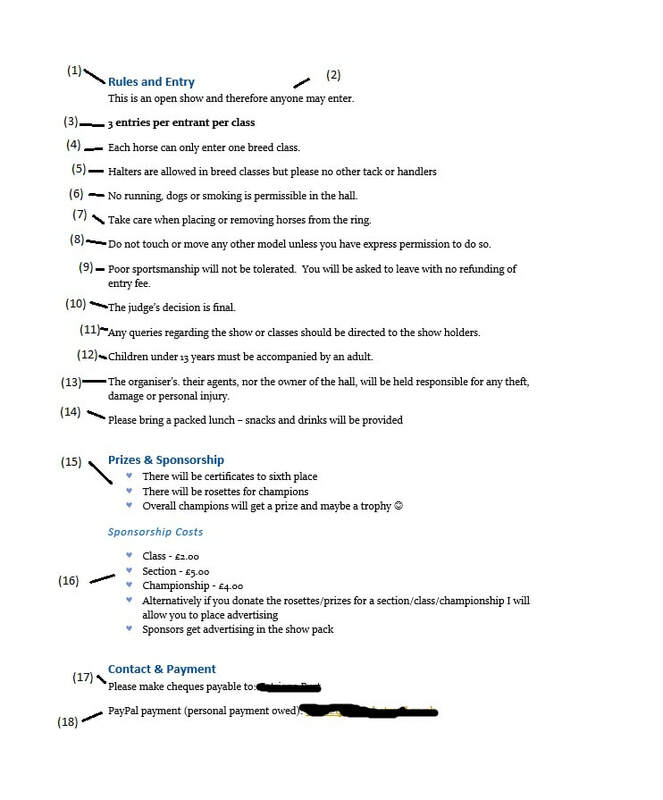 Some of these rules are dictated by qualification boards and some may be requirements of the venue. In order for a show to be a BMECS qualifier it must be open to all. This simply means that anyone can enter. This is how many entries you are allowed to put in each class. Many shows have rules regarding the use of halters. Some may permit it, some may not, some may require it. All shows will have common sense rules to protect entrants and their models, such as no running in the hall. This is an important rule, it is easy to knock someone elses horses if you are being a bit clumsy. Another rule designed to protect models. You should never touch someone else's horse without their permission. Moaning and complaining about judging either on the show day or afterwards online is really not on. If you have a question it should be directed to the judge or show holder on the day. However much you may not like it the decision of the class judge is final and cannot be changed. Most shows will require those under 18 to be accompanied by adults. This is an obvious requirement in order to protect vulnerable children but also prevent any damage due to younger hobbyists who do not quite grasp the rules yet. All shows will have a liability disclaimer, most show hosts will also have some form of public liability insurance. Information should be provided about whether or not the show host will provide lunch. Most shows do not and so you will need to bring your own. 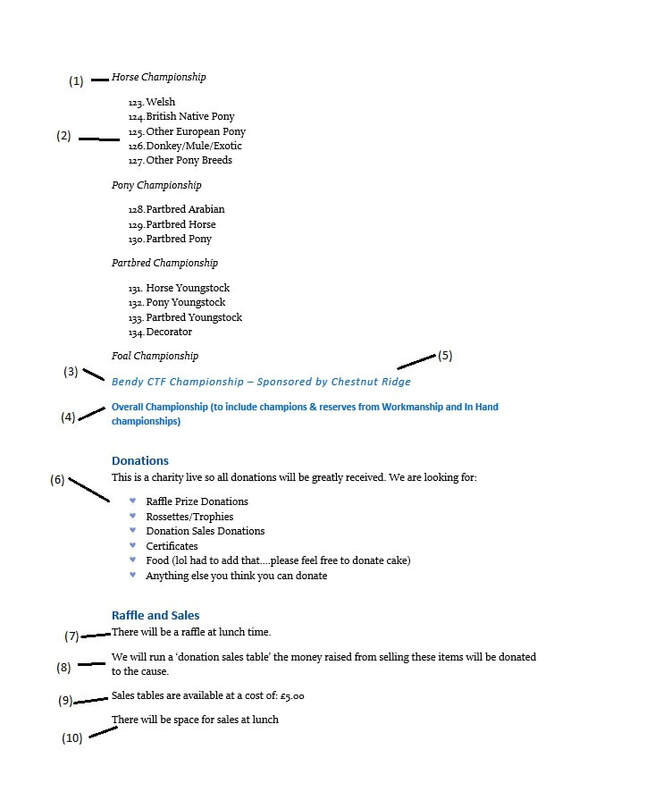 If you want to sponsor a section then this provides information about sponsorship costs. Details of who to make a cheque payable to. Details of where to send a PayPal payment to. This is where you should direct any queries or questions to. It is also where you should send any entry forms to. All good schedules will provide detailed directions on how to get to the hall. Print these out. You'll need them. All good schedules will include a map of how to reach the hall - print this out! This schedule is only an example. Schedules will all vary and some will be considerably better than others. If you are a show host think about what your entrant needs to know and please make sure to include it in your schedule! You should now be ready to start thinking about the show and preparing. It may be months away but there is no harm in being prepared right? OK so maybe don't go too over the top but don't leave it until the last minute anyway! The first thing you are going to want to think about are which models you are going to take to the show. To do this you will first need to look at the schedule. Firstly look at what sections there are, if the show only has classes for original finish models you won't be able to take your customs so that is them out of the picture straight away! As an example we will use the schedule above. This had sections for all types of models with the exception of performance so we can pretty much take any models we like. Now you need to have a look at entry limits. How many models are you allowed to enter in each class? Now you can start seriously thinking about who you are going to bring. What models you bring is up to you but obviously you are probably going to try and pick horses that you think will do well. Take a look at the condition first, exclude any models that have bad damage such as scratches or rubs. Now try and pick the ones that you think represent the breed you've assigned them best. If you are unsure about who to take you could choose them at random! Or you could do a bit of research and look at live show pictures online to see what has done well for other people. Choosing the right models is always a bit hit and miss, which is why I love the random method, it means that they all get a chance to be shown and I can occasionally be surprised by a horse that I didn't think would do well! The key is to make sure that you actually write something down in advance. It will make it easier to enter your horses on the day and help you keep track of things. Firstly make a list of all the classes and sections. Now write the names of the horses you want to enter next to each one. As well as their stable name include their show name, breed and colour (the later is to help you identify them if you forget names on the day)! Now make sure to leave a space to write down any results that your horse gets. Although you can write this on certificates some shows only award ribbons which cannot be written on! Finally don't forget to take this list with you on show day. At the bottom of this page you can find a free to download entry spreadsheet template. Just fill in the details for the show you are attending and off you go! You will now need to prepare your models for their big day. The first and most important job is to dust your models. Use a blusher brush to carefully remove dust from their backs and in the grooves of their mane. You want your model to have the best chance possible, so you want it to be nice and clean and sparkly. You could also touch up any minor rubs. If your model has a synthetic mane and tail then you will want to make sure this is well groomed. Most models such as Julips can be carefully brushed using a soft tooth brush and gently styled. The key is to make sure all your models look their best. You don't want them to be let down by dust or messy manes. Finally if the show requires you to tag your models make sure to do this as per the show's requirements. As a general rule you should put the breed on one side of the tag and then the horse's name and your name on the other. You should never have the horse's name or your name visible to the judge unless a show specifically states that you have to. Judging should always be done blind. Once your models are all clean and looking their best it is time to pack them for the show. Invest in some good quality plastic boxes (such as Really Useful Boxes) to transport your models so they don't get broken on their way too and from the show. Bubblewrap is the most common choice because it is relatively cheap, easy to get hold of and can be cut to the required size. Make sure if you are packing your models in bubblewrap to always pack with the bubbles facing outward. Pouches are custom made from a variety of different suppliers. They can be a simple fleece pouch or they can be padded with a flap that closes. They come in a variety of different designs and sizes. Although these are more prizes they are worth investing in. Last year when all my resin and china boxes did a back flip in the van not a single horse broke. Every single one was in a pouch of some form. They literally saved my ponies. You could also use other packaging materials such as foam or fleece. If you are using fabric be aware that some sticky finishes may stick to the fleece. Equally not everything offers great protection so you may need to use more of it to protect the model. For some models the original packaging may be an obvious choice to transport your model in. Many commercial resins and some OFs like Copperfoxes come in padded boxes that are designed to perfectly fit the model. These are perfectly good for transportation, although be aware that some things such as polystyrene may cause rubs if the model is repeatedly removed and put back in. The best way to pack most models is standing up in boxes with padding in between them. However, if this is not possible due to space requirements you can pack them lying down in layers with plenty of padding. Make sure that nothing is sticking out that could scratch another model and that they can't move around. Equally never put fragile things on the bottom of the box and never put heavy things on the top of the box! Some models may also need to be transported in their own box if they are particularly heavy, fragile or a weird shape. This article assumes you are attending your first live show and therefore won't be judging. However, I would strongly encourage every entrant to co-judge even if they cannot judge independently. If you would like to why not send the show host a list of classes you would like to help judge? They can then pair you up with a more experienced judge so you can start to learn how to judge. Try and get experience judging with as many different people as possible as everyone's style is different and some people are much better teachers than others. It will help you gain experience so that you can judge on your own one day. If the show you are attending has a performance section then you might want to have a go and put a few entries in. Performance can often seem daunting, especially when you see all the beautiful entries, but remember we all have to start somewhere and there is absolutely no harm in having a go. The more you do it the more experience you will get and the better you will get. Depending on the finish of your model you may or may not want to pack your models with their tack on. Packing with tack on is sensible as it saves you time on the day and makes sure you don't forget anything. However, metal hardware such as stirrups can damage model horses so make sure to wrap them up and keep them off the horse's sides. Some people may also pack with the dolls already on the horses. You may even see some entrants tie their dolls in place and then just cut them free on the day! This is all about saving time on the day particularly if you are entering multiple performance classes. If a horse needs a tack change then check the running order and pack for the first class bring the extra tack with you. It is recommended you don't go for too many fiddly tack changes or rider swaps as this adds a huge amount of pressure to an already stressful experience. When packing your entries up set them up first and then pack the horse and all the other items straight away. Doing this will make sure you don't forget anything. You will need tack, riders, props and bases for most entries so write a list and don't forget anything! Make sure to put any extra boxes with your main ones so they don't get forgotten. Make sure to wrap any fragile items such as dolls and other animal models to prevent them getting damaged on route. You will always leave with too much or too little bubblewrap. Make sure it is too much. If the show has a raffle make sure to take a raffle prize donation with you. This could be anything from chocolate to a model horse. Of course you will also need to pack anything else you might need for the show. It is a good idea to write a checklist. One of the most common things I forget is my camera battery! I always leave the battery slot open to remind myself to pick it up. The night before the show take a look at your route and plan how long it is going to take to get there. As a good general rule I would leave 1 hour for packing the car, 15 minutes to stop for coffee/petrol and 15 minutes for emergencies. You need to aim to get there at the time doors open. If you arrive early you can always sit in your car and wait but you don't want to arrive late. Make sure to check your journey for things such as road closures as these are not uncommon at weekends overnight. If you are taking a camera make sure to put it on charge (do this in the afternoon so that it is charged before you go to bed). Make sure to charge your mobile phone overnight! Double check you have everything ready and put it downstairs close to your door. That way you don't have to spend as long hauling things around the morning of the show, especially good if you have to get up really early. If you are taking a lunch make this the night before and pop it in the fridge. Write yourself a note to remind yourself to take it with you, it is so easy to forget it! Set your alarm and try to have an early night, it's going to be a long day! Prior to the show it is a good idea to keep up to date with any developments and goings on. This is also a chance to get to know a few of the other showers before you go. You may even spot some horses for sale that you would like to purchase on show day. The best way to do this is to join the Facebook group for the show if there is one. Otherwise check the website and your emails regularly. If entrants have questions about what classes models should go in then these are often posted in the Facebook group for the show. You may have the same questions so it is a good idea to check here first! Hopefully you didn't sleep through your alarm (don't worry we've all done it) and you are well rested and ready for a fun day of live showing! Once you are ready, have eaten some breakfast (although any sensible person will buy this from a slightly dodgy looking place on the way, it's all part of the experience) you can start to pack the car. Make sure everything is snug and secure and isn't going to roll around at all. You should also be able to see out of your rear view mirror so think about this when packing! Of course this will very much depend on how much you are taking and how big your car is. Grab your lunch from the fridge and then do a last minute checklist of things you might have forgotten. Make sure you have your phone and the directions to the hall as a sat nav may not always get you to the right location. On the way it is always worth stopping for coffee, if you have a long journey it helps break it up and quite frankly there is no way I'm going to be in a good mood at 8.30am without a significant hit of caffeine (obviously I don't condone the over use of caffeine but...). When you arrive at the hall check what time it is. You will probably have arrived a little early so may need to sit in your car and wait. If there are other entrants there already you could always head on over and say hi! When it is time to enter the hall look for the show host. If you stand in the doorway looking terrified and lost they will usually find you. They will probably be running around like a mad thing so don't be too put off by this! They will show you to your table (if they are assigned) or tell you you can pick any table you like (if they are not pre-assigned). You can now unpack your models onto your own table. Bring everything in from the car first and then lay a blanket over your table to protect your models. The best way to have your models is lying down but space may not always allow for this. Make sure if you have any wobbly ones they at least are lying down. If you need extra space you can lay pouches or bubblewrap across your boxes under your table. Make sure to store away all your boxes and extras neatly under your table or back in your car so they don't get in your way (or anyone elses). Get out your list and camera ready and then head into the kitchen and make yourself a cup of tea or coffee before the show starts. You could even offer to make one for your neighbour if they are still unpacking, that is bound to make you popular! If you have some time before the show starts wonder around the hall and have a look at everyone's tables. You do have to be brave I'm afraid, say hello and introduce yourself. Explain it is your first show and you will find that 99% of people will be really nice and accommodating. It is best to leave greeting anyone who looks in a panic unpacking or setting up performance pieces until later, they are probably a little stressed! At the start of the show the host will introduce themselves and give a brief introductory talk letting people know where the toilets and fire escapes are. Many shows will have stewards but even without an official steward there will always be someone shouting out the class in advance. Just pay attention and you shouldn't get too lost. Shows will be called according to the running order. There will normally be more than one ring with a different section running in each ring. Prior to every class a steward (or someone else) will call the name of the class. For example "Original Finish Arabian in Ring 1". When a class is called that you are entering take your model from your table and place it into the ring. If you have a breed card make sure to place this with it. If it is a mixed breed class include a slip of paper or a tag telling the judge what breed your model is. Most shows provide post it notes for this purpose. The judge or steward will then close the class before judging. They will usually do a final call along the lines of "Anymore entries for OF Arabian?" or "Final call for Original Finish Arabian in Ring 1". 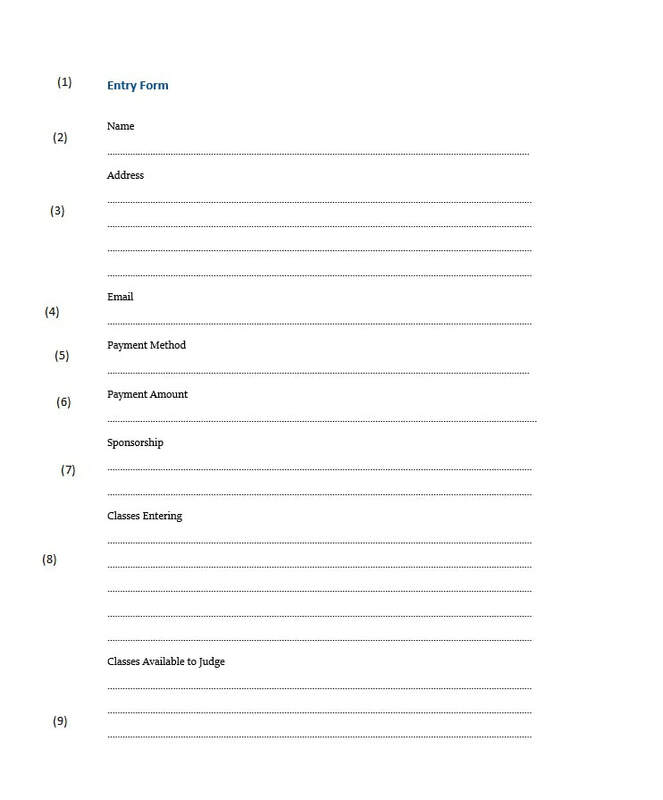 Once all the entries are in the judge will then proceed to judge the class. You will notice the judge go around the ring and look at each model in turn. They may then go back to certain models for a better look. They will read any information the entrant has provided to help them judge the model. When they are ready to do so they will place down the certificates for each horse. If the show is a BMECS qualifier they will have also signed the BMECS cards and placed one next to the 1st place horse and one next to the 2nd place horse. 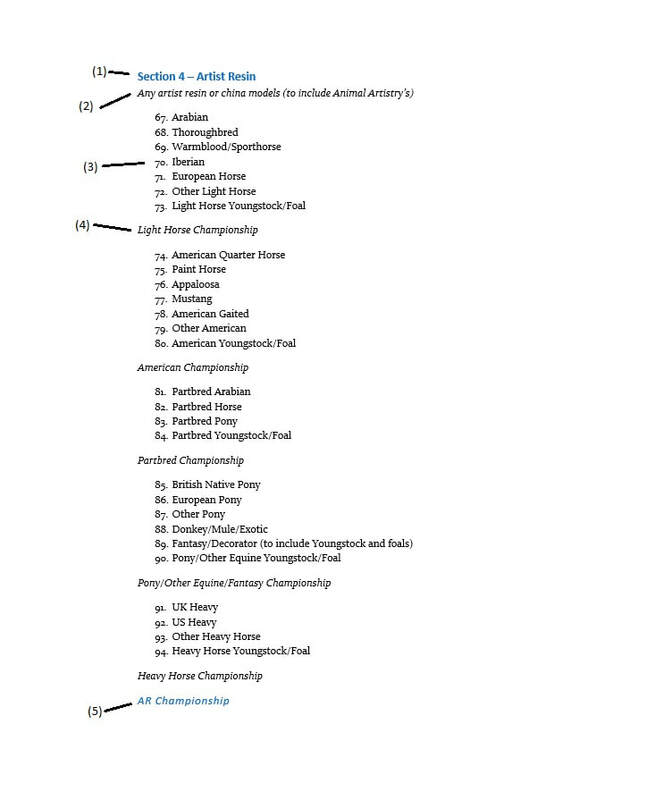 If your horse has placed 1st or 2nd you will need to make sure to write down your results (some shows do ask you to write down your results for lower placings as well). If you don't do this your BMECS cards won't be valid so it is important to do it! On the results sheet put your horse's name followed by your initials in the relevant place. If you aren't sure ask the show host to help you. 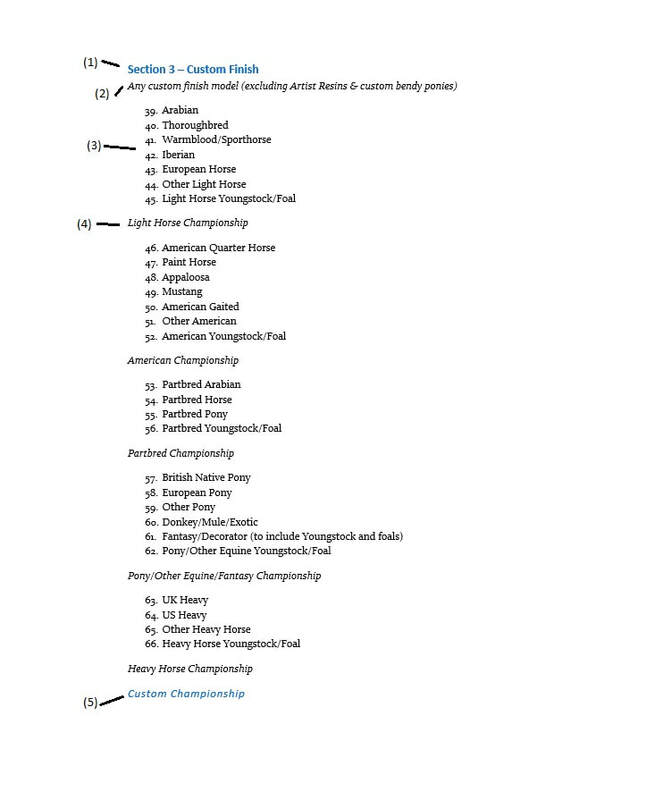 Depending on the show if your horse has placed 1st they will most likely move onto the section championship. Put the model to one side on your table with their certificate next to them so you don't forget. For other placings write the horse's name on the certificates straight away so you don't lose track of who got what placing! Some shows may have smaller championships and then larger section championships. If this is the case your 1st place model will go into the smaller championship. If they then take a champion they will move onto the section championship! 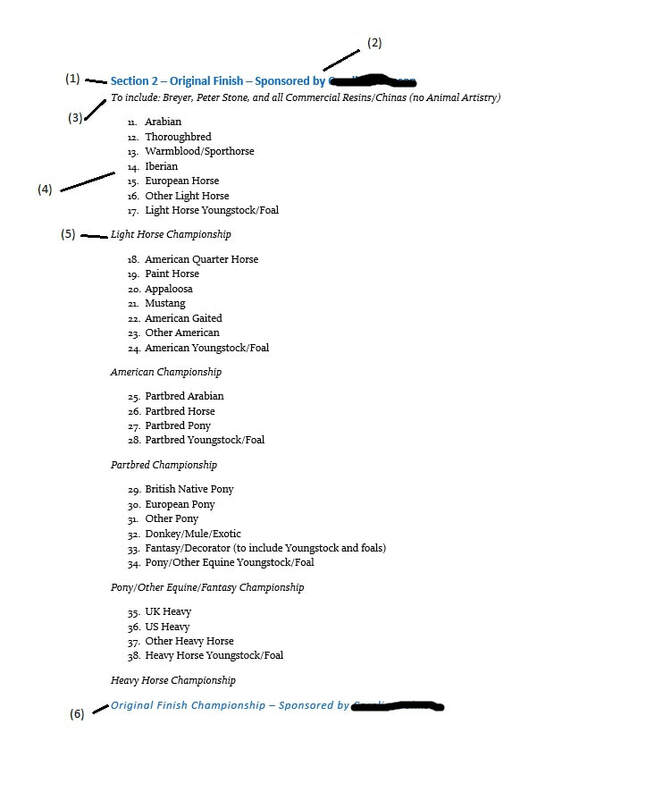 Championships will be called just like real horses, for example "Can we please have all 1st place horses from the OF light section into ring one for the OF light championship?" Some stewards may also read out a list of the classes that covers to help entrants. Listen carefully to the stewards instructions, they don't just spend their day shouting at people for fun (OK so some of us do...). There may then be a call for judges for a championship or someone may have already been chosen. If someone is judging the whole section they will normally judge the championships as well. For section championships and supreme championships there are usually at least three judges. If you don't have entries in these there is no reason why you cannot volunteer to help, it is a great way to learn and listen to the opinions of several different judges. At the end of the section the section championship will be called. If there were smaller sections within this then this will just be for champions within that section. If there were no smaller sections then this will be for all 1st placed horses within that section. Read the schedule in advance and check with the show host so you have an idea of how things are working. 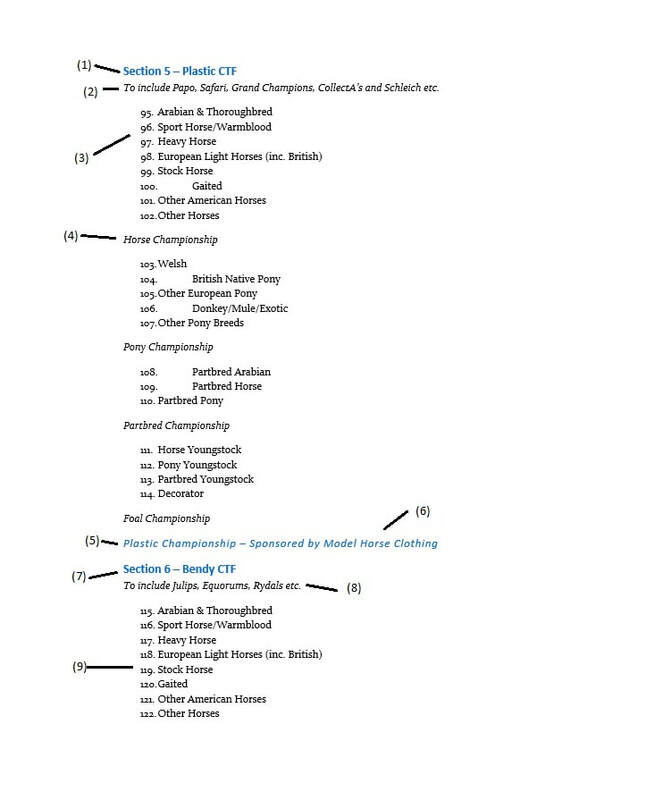 Most shows will also have a supreme or overall championship at the end of the show. This will be for champions and reserves from the various different sections. If you are not in this then definitely volunteer to help judge! This is always a tense moment and it is wonderful to see what will win. Honestly this is the worst part of any show. You unpack everything only to need to pack it again 2 minutes later. I hate it. The best advice regarding packing is to pack as you go. Do not. Ever. Leave it until the end of the show. Not only will you make yourself late leaving but you will usually make everyone else late leaving as well. The show host has to get home as well! If you have horse's that are moving onto championships then leave their results with them to help prevent any accidental packing of models. If you have packed a full box you can free up some space by popping it in the car (providing of course it isn't too hot). If you have a sales table pack this up towards the end of the show day as well. By the time the supreme is on the table you should be pretty much ready to go with nearly everything in the car. I usually have one box out if I have a horse in the supreme or if not nothing but my camera. As soon as it is judged I pack the last horse, take some pictures and head on my way. The journey home is often a long one and I have no desire to delay that at all. If you are finished packing and wish to help out you could help put away tables and chairs. This is particularly helpful if you don't have a long journey and therefore don't need to leave with the same sense of time pressure as others. The show host will thank you for it and you will help to make yourself a popular hobbyist. At lunchtime there is usually space to put out sales on the ring tables. Pop any models you have for sale down and then settle down to eat your lunch. There is usually a good selection of nibbles in the kitchen and you can also make yourself a well earned cup of tea or coffee. Of course make sure to browse the sales tables yourself. There will be all kinds of things for sale and there are usually some real bargains to be had. It is always worth having a look. At some point during the morning someone will have come around selling raffle tickets. It is not uncommon for shows to operate a pot based system for raffles. In this system you get both halves of your tickets. Split them in half. Put one half on your table out of reach. Take the other half and fold up the individual tickets and put them in the pots for the items you want. Remember, you MUST keep one half of your tickets! That way when the number is drawn you know that it is you that has won. Raffles will normally be called at the end of lunch. Sit down and listen for your number to be called. You never know you may get lucky! If you brought a raffle prize with you hand this to the show host at the beginning of the show for the raffle prize table. Finally use lunch as an excuse to make some new friends. Have a chat to your neighbour and introduce yourself to people. If you are not sure what to say then simply start with a compliment about one of their models, model horsey folk are always happy to talk about their models. You are probably really exhausted by now and so you should be! Live shows are tiring things. It is always best to stop for dinner on the way home in my opinion. Nothing justifies junk food like a live show and remember the British motto: Service Station Calories Don't Count! You've earned that burger. Once home unpack the car and then head off to bed. You can deal with unpacking and everything else the next day. Obviously if you are feeling very enthusiastic you can do the following the evening of the show but I've been to enough shows to know that doesn't happen! The first and most important thing to do is thank the show host, judges and stewards. You should have thanked the host as you left anyway but it is always polite to do so online as well. You can now also share any pictures you took on social media, people love seeing live show pictures so give something back and share them with others. You could also look through other people's pictures from the show, there is bound to have been something you missed! You will also need to unpack your models, this is best done sooner rather than later particularly in hot weather to prevent any damage. Put everyone back in their place and of course give them a secret hug if they did well. Finally you need to write up your results. How you do this and how you keep your records is entirely up to you but it is a good idea to get into the habit of doing this straight away after the show so you keep on top of it. You will also need to check the official results. These will usually be uploaded into the Facebook group within a few days of the show for you to check. Make sure that everything is correct according to your records and any gaps are amended. Remember if your results aren't written down then any BMECS tickets you have won't be valid. ​And finally...start looking for that next show! Below are a selection of free downloads to help you with your first show. At the time of upload these files had no issues that I could see. If you experience any issues with them please let us know so this can be sorted for other users. This template can be filled in with the details for the show you are attending to help you keep track of what models you are taking with you. Print it out or take a digital copy, whatever is easier for you.